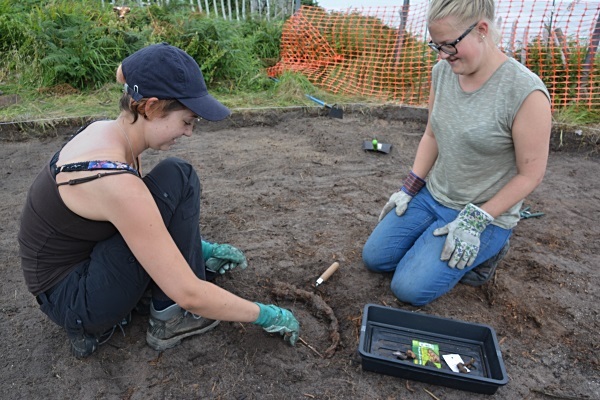 The community involvement component of the 2016 Hilbre Island dig is now complete. We would like to thank all those who took part for their interest, enthusiasm and hard work. In the Bird Observatory garden, during the last session (August 6-9) the layers of wind-blown sand and buried topsoil were largely removed from both trenches. Now that most of the area has been excavated down to weathered bedrock, we can begin to make sense of the site as it would have been in the early medieval period. In the middle of the north trench there is a strong concentration of cobbles. These stones were probably collected from the beach and transported for use as building material. They seem to have been carefully selected for their size (8-15 cm) and shape. At the west side of the area the stones are tightly packed between two larger cobbles before fanning out and becoming less concentrated at the east end. This cobbled area lies precisely along the projected line of postholes and appears to have been laid to consolidate an area of ground that was subject to a lot of wear or trampling. The most likely interpretation is that the area formed the threshold to the building. Another important development of the last few days was opening several test-pits in the northern part of the island to investigate elements of the late 17th-mid18th century salt processing works. We plan to report on that briefly in the next blog. As the project draws to a close, it’s already time to think about what’s next. In September, we will be submitting a grant proposal to obtain funding for another phase of community archaeological work on Hilbre Island. To assist us in developing the project proposal, we would like to gather feedback from anyone who has volunteered over the past month. Your comments will help us design this larger project and improve the experience for next year’s volunteers. If you can spare a few minutes, we would be very grateful. As the excavation on Hilbre Island has now passed the halfway point, this seems like a good time to give a summary of the stratigraphy of the site as we understand it so far. The top layer in the north trench (II) produced a number of finds varying considerably in terms of age. 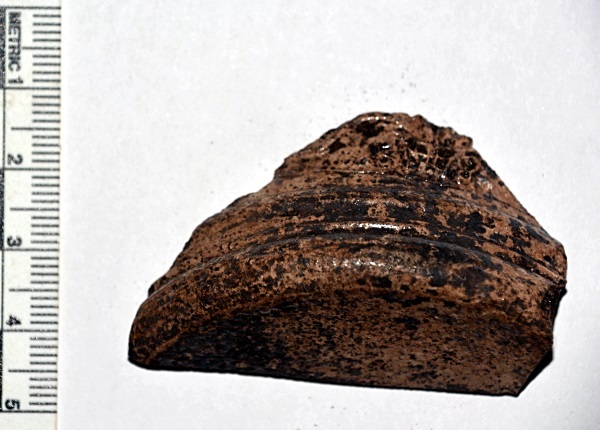 Heat-shattered stones (most often associated with prehistoric deposits) were found alongside much later material (18th century pottery) and modern debris (elastoplast and sweet wrappers). This mixed content combined with the presence of spade marks in a lower level suggest that disturbance, perhaps through gardening, has occurred in the relatively recent past. The presence of material that is older than the layer below suggests that the project involved the importation of soil, probably from another area of the island. Directly below the layer of mixed material lies a deep layer of wind-blown sand. The layer contained very few finds. Only light objects, which could be blown by the wind, were deposited along with the sand. These items are modern – polystyrene, small bits of paper and plastic- indicating that the layer is also modern. We would be interested in hearing from anyone who knows of a particularly powerful storm on Hilbre between 20 and 50 years ago which might have produced this layer. Below the layer of wind-blown sand is a layer of compact dark-grey soil. 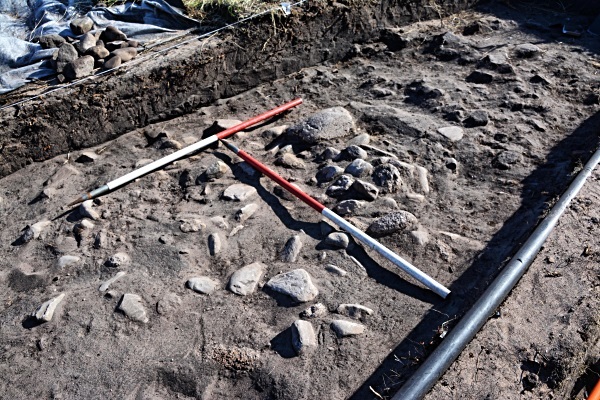 This layer, a former topsoil deposit, contained finds dating from the 16th – 19th centuries, including coal, window glass, and two very finely made Cistercian ware cup rims. A number of stones protrude through this layer. Some are local sandstone which has broken apart and been deposited naturally. Others have been brought in, probably from the beach, and seem to have been deposited intentionally. A circular cluster in a layer such as this can indicate the presence of a post hole, as stones were used for packing the hole and securing the upright. The south trench (III) followed a very similar sequence but yielded fewer finds overall. The next step will be to carefully clean the surface of each trench by trowel in order to expose the bedrock below. It is here that we hope to find rock-cut post holes. We hope the discovery of additional post holes will reveal more about the size, shape and orientation of the building discovered in 2006 when the bird observatory pond site was excavated. Digging begins again on Saturday August 6th. Many thanks are due to the volunteers over the last week: Peter, Marianne, Tom, Sarah A., Sarah B., Bill, Ann, Andy and Mark. Digging has officially begun on Hilbre Island and the weather has been (mostly) warm and sunny so far. Two trenches are currently open, one at each end of the area excavated in 2006. The trench at the north end (Trench II) contained a deep layer of sandy soil, which was expertly relocated to the soil heap by our first group of very hardworking volunteers. This layer was too thick and riddled with bracken roots for trowelling and so had to be removed using spades (especially arduous in heat like we had on Wednesday). 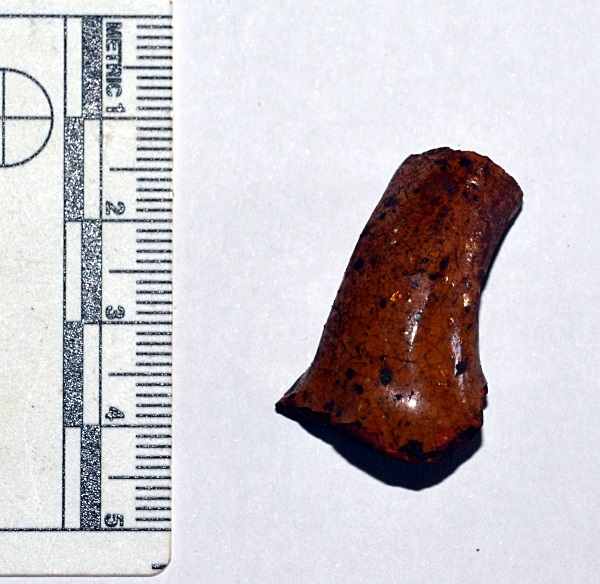 The effort paid off though, because the sieved soil produced a range of finds from the pre-historic (heat-shattered stone) to the very recent (a band-aid). Two finds were particularly interesting. The partial base of a stoneware tankard dating to the late 17th was the most aesthetically pleasing. The fact that a large section of decorative crest is visible, means that with a little research, we might be able to identify not only the country of origin, but perhaps even the maker of vessel. We will keep you posted. Not quite so aesthetically pleasing, but definitely the largest object found so far, this heavy metal link chain required carefully considered removal. 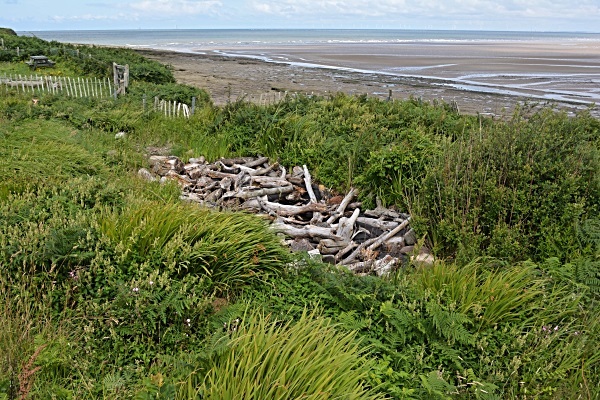 Given the location of this dig, a maritime connection is almost a certainty. Meanwhile in the trench at the south end (Trench III), digging has been a bit easier. The absence of such a thick layer of sandy soil meant that trowelling could begin relatively quickly. There was a marked absence of modern material compared with the north trench. Finds here included some flint and a number of heat-shattered stones. Two of these stones fit together, indicating that they underwent heating on the site. Stones were heated in the fire and then dropped into water held in organic containers (wood or leather). This allowed water to be boiled without having to apply direct heat to the container. Stones could only be heated so many times before cracking. A smooth outer surface and a very jagged inner surface are characteristics of heat-shattered stones. This method of heating water was used during the pre-historic period as well as the early medieval period. We also found two particularly interesting pieces of pottery in this trench. 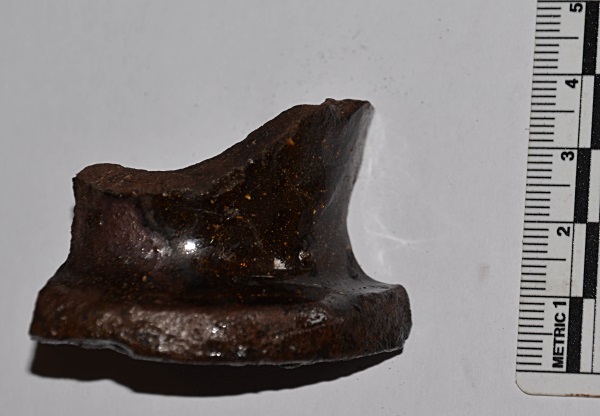 The first was a small handle, probably late medieval or early post-medieval. The partial fingerprint of the potter is visible on the unglazed underside. The second is the partial base of a tyg (multi-handled drinking cup). This piece probably dates to the late 16th or early 17th century. It was probably made locally, possibly in Buckley. In addition to these finds, a number of stones have been revealed in the trench and we are now starting to look at their positions and configurations as possible indicators of architectural features such as post holes. As pontificating began, a (so far) rare and unfortunate rain shower meant that we had pack up early and take cover in the day room. When the rain stopped, we went back for one last look to make sure no tools had been left behind. We were surprised to see that the rain had exposed a respectable length of clay pipe (the first on the site so far) in the middle of the south trench. And so we will begin tomorrow. Special thanks to Emma, Emmie and Melissa, our first group of volunteers. Their enthusiasm, curiosity and quick absorption of information has ensured that this dig is off to a great start. Thursday 14th July was a beautiful and busy day on Hilbre Island as preparations began for the upcoming archaeological investigation. 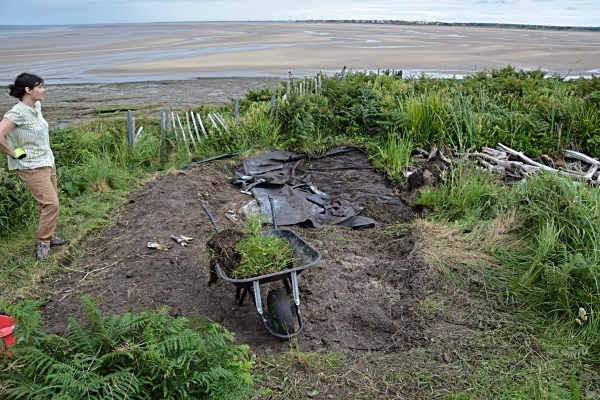 The project, organised by Rob Philpott and Christine Longworth in collaboration with The Friends of Hilbre, builds on a previous project carried out by Rob Philpott in 2006, when evidence of an ancient building was uncovered on the plot of land adjacent to the bird observatory. 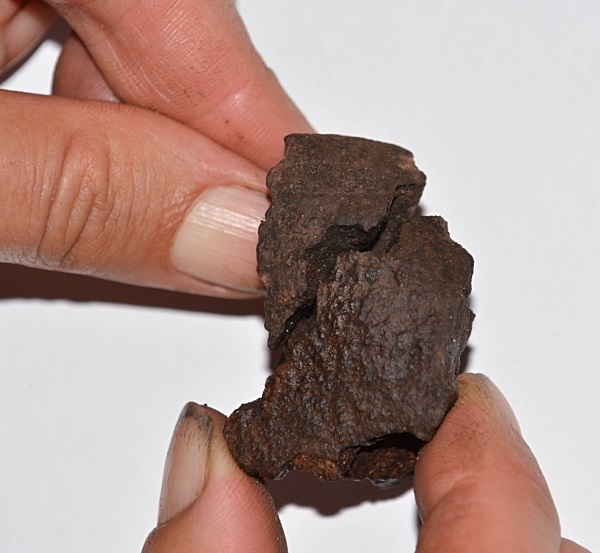 The post-holes of a rectangular structure were found, but no dating evidence, though we think it may belong to the early medieval period (AD 400-1100). Dwelling houses from this period are rare finds in north-west England, making this a particularly important discovery. Other finds from the 2006 dig included pieces of prehistoric pottery and medieval tile, a testament to the island’s longstanding place in the lives of local people. About a year ago, a few of us spent the day on Hilbre and decided that after nearly 10 years, perhaps it was time for another look. And so a new project began. When we arrived on Thursday to ready the site, we were sobered to see the density of vegetation covering the area. It seems that plants grow quite a bit between April (when we were last out) and July! The excavation starts on Wednesday July 20th and we are now looking forward to letting you know (via this blog) how things progress and what discoveries we make. For those of you who will be joining us for a few days on site over the next couple of weeks, we’ll see you soon!